The connection of typology with the development of Christian worship seemed obvious to me as a young man formed by both highly liturgical Anglo-catholicism and those parts of the 1960s-70s charismatic renewal emphasising the worship of the community as somehow part of our "offering" to the Father through Jesus our great High Priest. While not being totally convinced on absolutely every point she makes, I think that her book, The Great High Priest: The Temple Roots of Christian Liturgy is nothing less than magnificent. In my opinion it should be required reading for all thoughtful Christians! Only the high priest was permitted to pass through the veil and to stand before the throne or, in the desert tradition, before the ark, and he was only permitted to do this once a year on the Day of Atonement. The words of Leviticus 16:2 could imply that at an earlier period, the high priest had entered more frequently: “Tell your brother Aaron not to come at all times into the holy place within the veil, before the mercy seat which is upon the ark, lest he die.” Entering the holy of holies was a terrifying experience, because the LORD appeared to the high priest “in the cloud upon the kapporet”. Before making the blood offering, the high priest took incense into the holy of holies, and this seems to have been a protection for him. “Put the incense on the fire before the LORD, that the cloud of incense may cover the kapporet which is upon the testimony, lest he die” (Lev. 16:13). In later texts, the high priest carries a “fire pan” in to the holy of holies and places it before the ark. Then he puts the incense on to the charcoal, and fills the holy of hollies with smoke (m. Yoma 5:1). Other texts, however, imply that there was a golden altar, within the veil of the temple. The Letter to the Hebrews is clear; in the holy of holies stood the ark and the golden altar of incense (Heb. 9:3-4). The Hebrew text of 1 Kings 6:20 - 22, however, is not so clear, but could have described a golden altar within the veil. Unfortunately, the line, “He covered with gold the altar that belonged to the holy of holies” (1 Kgs. 6:22) does not appear in the LXX, and the text of v. 20 is disordered. The Vulgate, which is quite clear that there was an altar within the veil, was translated at the end of the fourth century CE by Jerome, who would have known the Letter to the Hebrews and thus would have read the ambiguities of 1 Kings 6:20 in the light of the later Christian text. However the incense was actually offered, the tradition is clear that the high priest needed the incense as protection when he entered the holy of holies, and that the incense used in the holy of holies was a special blend. It was deemed “most holy”, and anyone who used that blend outside the holy of holies was “cut off from his people” (Exod. 30:34-38). Entering the holy of holies with a cloud of incense is the temple reality that underlies the visions of the human figure entering heaven with clouds or of the LORD appearing in clouds upon the throne. Thus did Isaiah describe his call to prophesy: he saw the LORD enthroned in the temple, between the six-winged seraphim, and the house was filled with smoke (Isa. 6:1 - 4). Daniel saw a human figure “one like a son of man” coming with clouds of heaven to the Ancient of Days (Dan. 7:13). When Luke described the Ascension he said that Jesus was “lifted up, and a cloud took him” (Acts 1:9). Jesus was passing beyond the veil, beyond the constraints of time and place. The men in white said that he would return in the same way. John introduced the Book of Revelation with the assurance, “He is coming with the clouds” (Rev. 1:7), and John was granted his own vision of the LORD’s return, which he recorded as the Mighty Angel coming from heaven wrapped in a cloud, with a rainbow over his head (Rev.10:1). Entering the holy of holies was entering heaven. And so these visions of a human figure going or coming with clouds must be understood in the temple setting of the high priest entering the holy of holies on the Day of Atonement. Peter’s sermon in Solomon’s Portico shows that this was indeed how the early Church understood the departure of Jesus. 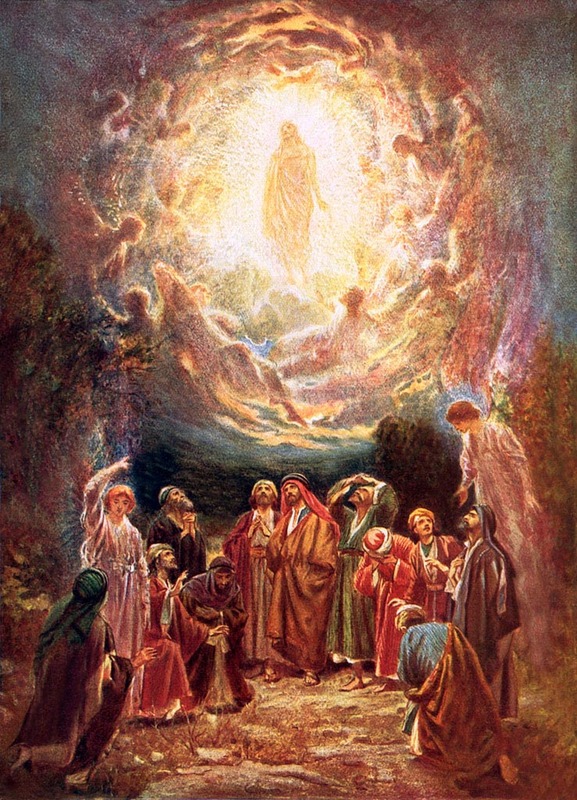 He had gone to heaven as the great high priest, and would emerge again at the appointed time, that is, to bring renewal from the presence of the LORD. This is exactly what happened on the Day of Atonement, sin was judged and the earth was then cleansed and healed for the New Year. Hence Peter’s warning: “Repent, that your sins may he blotted out” (Acts 3:19 - 21). What had been ritualized annually in the Day of Atonement was happening in their own times through the self sacrifice of the great high priest Jesus. Jesus had passed through the veil into eternity; he was outside time and matter and so had passed into the eternal present, no longer limited by the particular time and place of first-century Palestine. This is the context, too, of the words in the “high-priestly prayer” in John 17. Jesus knew that he was about to pass through the veil, that he was returning to Day One, i.e. beyond and “before” the creation. Thus: “Father, glorify thou me in thy own presence with the glory I had with thee before the world was made” (John 17:5). He is offering for his own. Yea, till time shall be no more. Still imparts his flesh and blood.